While I love summer and the sunshine, I enjoy fall because I can cook lots of hearty delicious meals. In the summer, I tend to use the BBQ and prepare salads. By the end of August, I cannot stand eating a salad! So when September comes and those fall harvest fruits and veggies appear in the farmer’s market, I am drooling just by seeing them and imagining them simmering in my kitchen. One of my favorite meals in the fall is soup. It is easy to prepare, hearty and an affordable meal. I usually prepare soups ahead of time, freeze them and serve them with a meat loaf, or some delicious homemade bread. 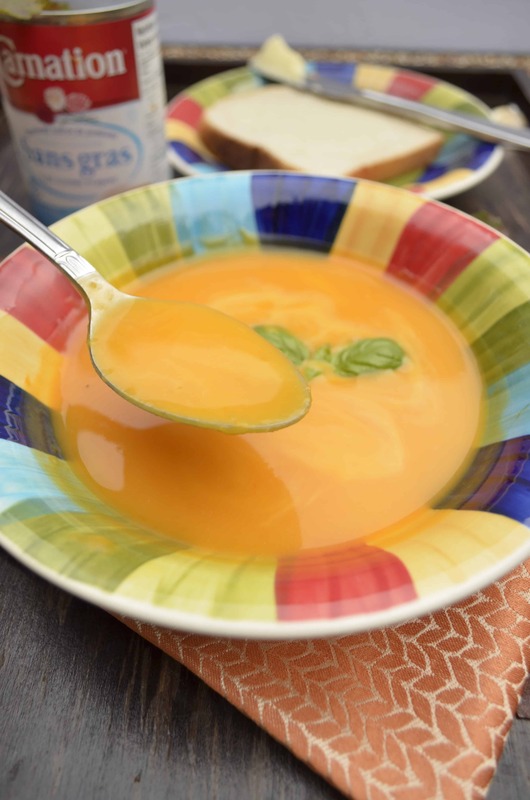 Butternut squash is one of my favorite soups: It is so tasty and ready within 30 minutes. I prepare it on a regular basis. I usually add milk to it but milk makes it a bit too watery. 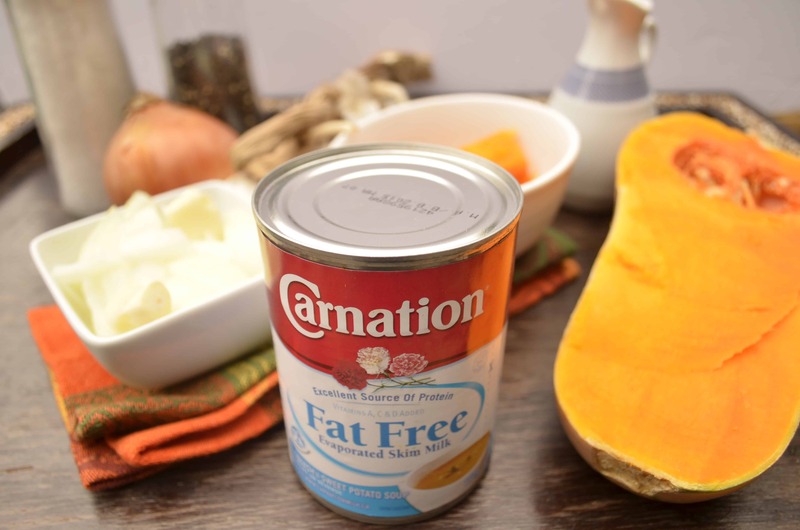 For today’s butternut squash soup, I am using Carnation® Evaporated Milk. It has less water than regular milk, which makes the soup thicker, richer and most of all, tastier. Carnation Evaporated Milk has been a staple to help Canadians make creamier recipes for years, so I knew I could trust it to do the same for me! The soup turned out so good that my teen, who is not fond of soups, asked for more. He even asked me to cook it again. So the following day I went and bought 3 more butternut squashes to cook more! Now let me tell you how to prepare this easy recipe. I used a Butternut squash recipe that I found on the Carnation Evaporated Milk website. It has amazing recipes from appetizers, soups, breakfast, desserts and main dishes. All of them are easy to prepare. Make sure to visit Carnation Evaporated Milk website for great inspirational ideas and step-by-step videos. 4 cloves of garlic chopped. ¾ cup of Carnation Milk Regular, 2% or Fat Free Evaporated milk. Since I make 2 batches, each time I used a different evaporated milk. In a large saucepan, heat oil and add onion, garlic and pepper flakes. Let is simmer until onions are tender. Make sure not to burn. Add squash diced and let it cook for 3 to 4 minutes. One of the easiest ways to peel a squash is to microwave it until it becomes tender. Make sure to make holes with a knife or a fork before microwaving it. Add stock, salt and pepper and bring to oil. Cover and let it simmer for 30 minutes or until squash is tender. Return to heat, stir in Carnation Evaporated Milk. Well I told you the results above, my son loved it and asked for more. All the rest of the family members enjoyed every spoonful of it. It was rich, creamy, filling and so good. I liked how easy it was to add Carnation Evaporated Milk. It is simple to use: just open the jar and you are all set. I like that I can store it in my pantry when it is not open. And it’s not just for soups. Carnation Evaporated Milk has been helping Canadians bake delicious recipes like pumpkin pie and fudge for years! Visit the Carnation Evaporated Milk Website to explore all their delicious recipes! What is your favorite recipe using Carnation Evaporated Milk? Tell us in the comments! How Do You Handle it When Your Child is Cyber Bullied? Thanks for sharing this recipe with your readers. I love butternut squash and I already know that I will love this soup. I’m always looking for new recipes for home made soup and this one looks and sounds delicious, I can’t wait to try it! This looks like a perfect soup for a chilly afternoon! Thanks for the recipe! What a great easy soup recipe! My kids loves butternut squash. I love a good soup and this one sounds delicious! This sounds delicious! I’d pair it with “monkey bread”. This soup sounds great! I’ve made so many great recipes with Carnation Evaoprated Milk. This sounds amazing. I love the simple list of ingredients as well. Oh my that looks so tasty! Perfect for a chilly fall/winter night! I have some squash sitting around! I’ll make this! thanks! I love Butternut Squash soup but have never tried to make it. I am going to try this recipe. Thanks for sharing. Butternut squash soup is one of my absolute favorites to make! I also use the soup as a base to make a sauce that goes wonderfully with a salmon steak. I’ve never made butternut squash soup before, it looks delicious though. I think it would be perfect on a cold day. I had butternut squash soup for the first time a month ago and fell in love! Thank you for this amazing recipe! 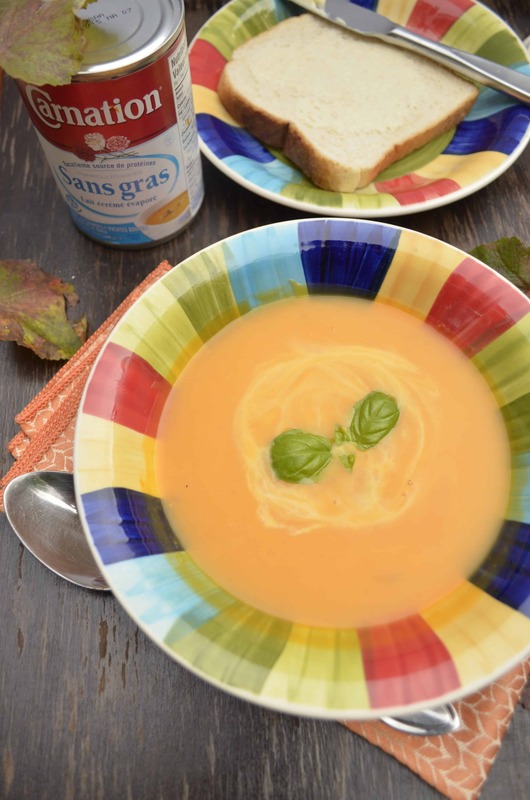 I like soup all year long and the recipe you have here looks just like a cool fall day. This looks so delicious! I love butternut squash soup, especially on a cold winter day. Carnation evaporated milk tastes good with anything. Yummy. I love soups. I use Carnation Milk in many of my recipes. This looks delicious. I bet it tastes good too. Sounds so good! I love butternut squash anything so this would be great! Oh that sounds really good. I so need to try this recipe, I just bought an acorn squash today. This sounds soooo good! I know my kids would love it! Looks so yummy. Perfect Fall comfort food. These would be wonderful with all of these cold days. I would most likely pair it with cheesy tortillas.